Buy A Free CarEliminate The Muda! This is not one of those, it’s too good to be true scenarios. You really can get a car for free (or nearly so) thanks to our leaders in Washington. I guess it won’t be quite for free because our tax dollars are going to cover the cost of the actual car and then there is also a question of shipping costs that need to be addressed. In October of 2008 Congress passed the Emergency Economic Stabilization Act. More commonly referred to as TARP it was primarily intended to allow the government to buy troubled assets in an effort to stabilize the financial markets. However, a little know aspect of this Act also provided funds to promote the purchase of Qualified Plug-In Electric Vehicles. Before you head off to buy a Tesla for $100,000 understand that this credit is not for just any electric car, it is for what they refer to as NEV or Neighborhood Electric Vehicles. I’d call them golf carts. But still, a golf cart for free is nothing to sneeze at. 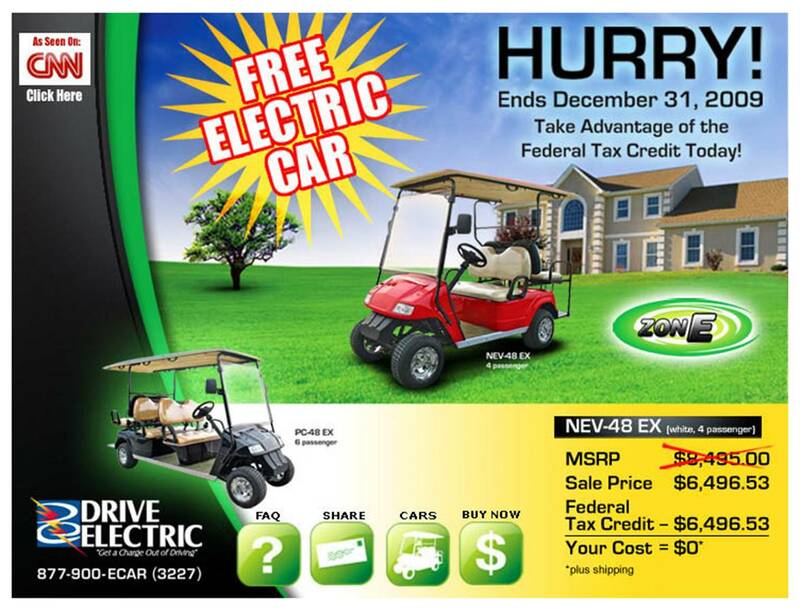 You can’t get much more frugal than a new car golf cart for free! To take advantage of this deal you are going to have to front the money for a few months. The government, as nice as they are, is not simply going to ship you a golf cart. You must buy it first; in fact you must buy it by the end of this month! What’s interesting though is that while you must buy it, it may not be delivered for several weeks. Buy hey, the IRS is willing to work with you as long as the manufacturer gives you the serial number and Manufacturer’s Statement of Origin. Depending on the specifications of the vehicle you can get from $2500 all the way up to, it would appear, nearly $6,500 in tax credits. While I call these golf carts they are really more than that. They feature seat-belts, a full set of lights, and even rear view mirrors. 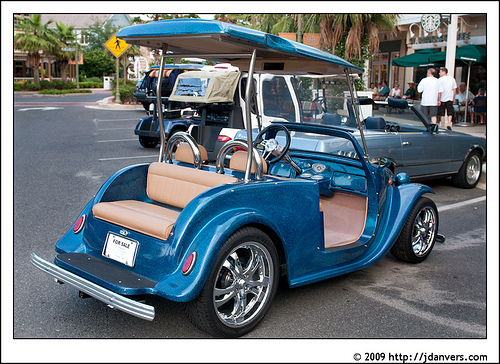 Though you may purchase a plain Jane style cart there is nothing stopping you from pimping your ride. Take a look at this article from Wired Magazine for inspiration. How’s that for putting our taxes to work? What do you think of this program, is the government making good use of our money? Gah! More pork. I love seeing my tax dollars go to things I’ll never be able to use. The little electric cars are pretty cool, when I was in the Air Force and Air National Guard we used them to get around on the flightline to get to and from the airplanes. The avionics guys even had a little truck version so they could carry their black boxes in the back. Needless to say I won’t be rushing out to buy one before the end of the month. .-= David @ MBA briefs´s last blog ..How to analyze stocks like a pro =-. I hate to say it, but I honestly considered this. Unfortunately, it cannot be purchased for “resale.” I know we wouldn’t use it and I don’t need any more clutter so we won’t be rushing out either. Too bad, I was really hoping to use the “but honey, it was on sale” line on my wife!